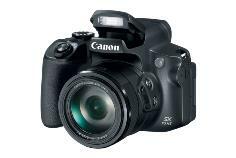 Canon has released the PowerShot SX70 HS compact camera. This new, 4K point-and-shoot has a 20.3MP sensor, an optical zoom of up to 65x and extensive image stabilisation. It also has an electronic viewfinder, which is an OLED panel made up of 2.36 million dots. It is also compatible with RAW recording. The PowerShot SX70 HS is Canon's latest point-and-shoot offering. It comes with a 20.3 megapixel (or 2.3 CMOS) sensor, and is capable of up to 4K recording. The PowerShot SX70 HS is also the first Canon digital camera to support recording in .cr3, the most up-to-date RAW format. This new model also has a DIGIC 8 processor to support optical image stabiliZation (IS). The PowerShot SX70 HS is capable of 5-stop IS for smooth capture without a tripod. Even so, the PowerShot SX70 HS is also rated for multii-image shooting at a rate of up to 10 frames per second (fps). The PowerShot SX70 HS also has a 3-inch color TFT-LCD screen to help frame the ideal shot. However, it also has a viewfinder, which is in fact a small OLED panel with a 2.36 million dot density. Canon claims that this 0.39inch screen can represent what passes through the lens with high accuracy and at a super-high resolution. This camera is also capable of x65 optical zoom and 4x digital zoom. Canon also asserts that this gives a combined zoom of up to x260. It also has a Zoom Framing Assist button on the stock lens to adjust the viewing angle on the fly. Canon also states that the new PowerShot has an automatic focus of 0 inches to infinity in the wide setting. At present, it has an estimated retail price of US$549.99. All in all, the PowerShot SX70 HS seems like a decent option for photography enthusiasts in need of a compact point-and-shoot.